2017 Summer Event Ship Stats! During Star Trek Online’s 2017 Summer Event you will be able to obtain Lohlunat Prize Vouchers (2017) by participating in the “Flying High” event on a daily basis. These Prize Vouchers can be earned once per day, and used to complete an Event Reputation project to obtain the Vorgon Ryn’kodan Carrier [T6]! This project requires 1000 Lohlunat Prize Vouchers (2017). 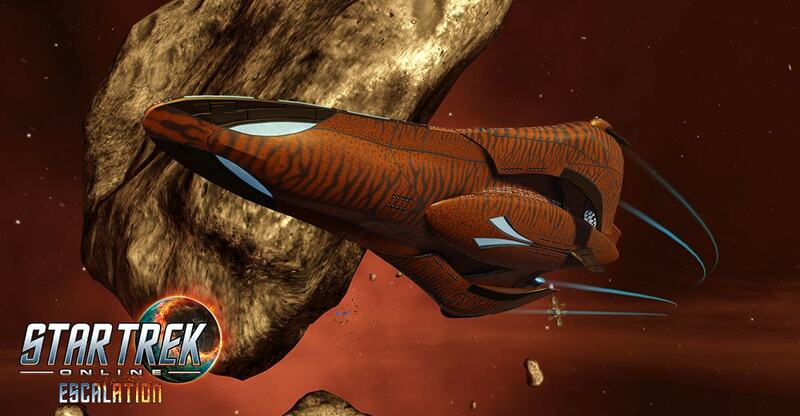 Once this starship is obtained by any character on your account, any characters on this account can claim the Vorgon Ryn’kodan Carrier [T6] from the Account Claim tab within the Event Store (in the Event Reputation window). The Vorgon Ryn'kodan Carrier is the durable command and control vessel that makes up the focal point of any Vorgon attack fleet. Though lacking the maneuverability of other Vorgon vessels, this extremely resilient ship is capable of outlasting foes foolish enough to underestimate its capabilities. This starship features a Lieutenant Universal/Temporal Operative Specialist seat. The Vorgon developed this unique drone in an attempt to duplicate the effects of the Tox Uthat - a powerful device they once aggressively sought across the time-space continuum. The drone is equipped with a phasic inhibitor which can absorb directed energy, inverting the flow in such a way to debilitate attackers' weapons. To add to its utility, the Vorgon also outfit these drones with defensive enhancements that fortify and regenerate the shields of the ship that launches them. This console provides a passive boost to Shield Subsystem Power and Projectile Damage. After achieving Level 5 in your Vorgon Ryn’kodan Carrier (T6), you will unlock the Restorative Support Starship Trait. While this trait is slotted, using Hull Heal abilities will create a support probe at the target's location (or self). This probe will constantly restore a small amount of Hull on its target, as well as passively draining the shields of nearby foes.